Bring on the Colorado winter at Keystone Resort. Get outdoors and play on the mountain. 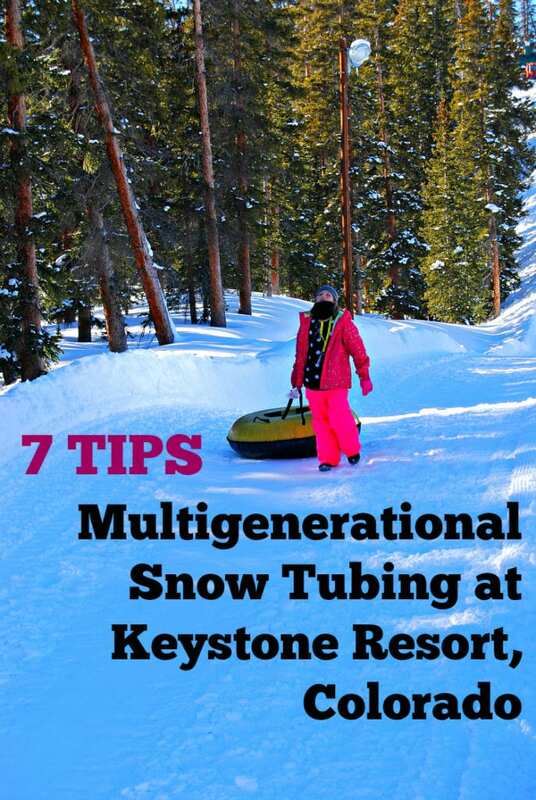 Not all of our multigenerational family is into skiing or snowboarding, so we compromised and added multigenrational snow tubing at Keystone. Yes, it’s as fun as it looks! 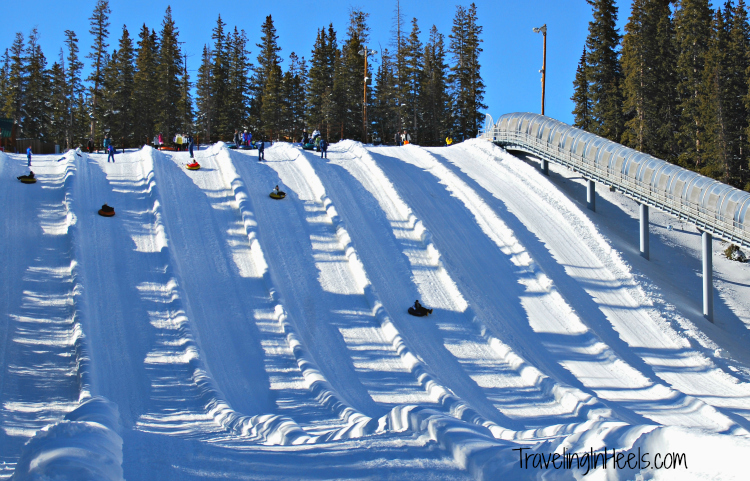 I’m an adventure-loving Traveling Grandmom, and although I do enjoy skiing on occasion, how could I resist a day of multigenerational snow tubing at Keystone Resort in Colorado was fun for my whole family, from toddlers to seniors. 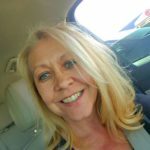 Growing up on a farm in southeast Iowa, the hilly terrain was an outdoor activity for me and my five siblings, slip-sliding (and often tumbling) down the snow packed hills on cardboard boxes or plastic sleds. It’s not all about the downhill skiing or snowboarding for your Colorado Ski Vacation. Keystone Resort , like many Colorado resorts, is high on the list for family friendly. Snow tubing is perfect winter activity for the family. It starts with a gondola ride together, two stops up to Adventure Point Tubing, near the Snow Fort, where you can also find many “Kidtopia” kid-friendly activities. The Adventure Point Tubing hill is just like when I was a kid – only way bigger! Seriously, Iowa does not have these tubing hills — and these are just one of many in Colorado! Wowza! And you don’t have to walk back up the hill dragging your tube behind you as the conveyor magically takes you back to the top. Be sure you dress warm. You are in Keystone, Colorado, and you’ll be taking the gondola up to higher elevations. Temperatures can be colder than at the base. Dress like you’re skiing: ski pants and/or waterproof clothing, gloves, goggles/sunglasses, and snow boots. Ski boots are allowed, but honestly wearing them is awkward and you want be able to link up with the rest of your group. Check in Early and Don’t Be Late. 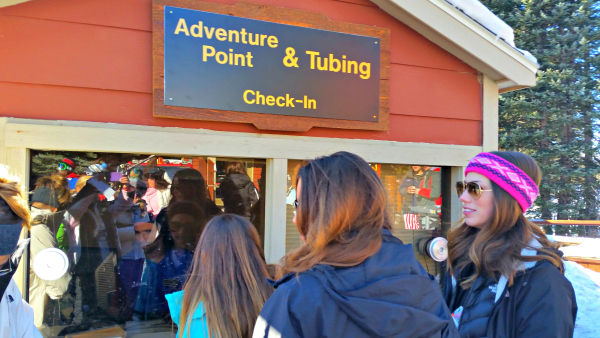 Check-in a minimum of 45 minutes prior to reservation at the Adventure Point Check-In Hut in River Run’s Gondola Plaza, or if you’re already at the top, check in 15 minutes prior to your reservation at Adventure Point at the top of Dercum Mountain. We drove in from Denver and underestimated the amount of time it took to check in and ride the gondola up. We arrived at 12:50 p.m. for 1:00 p.m. reservation time, but did not realize an orientation was required. Next orientation was 1:00 p.m., and we didn’t get on the hill until 1:15. Result: 15 minutes deducted from our tubing time. Have fun. Get ready to laugh until you cry. Lots of giggling, screaming and family fun. Walk to the top of the hills and wait your turn. Your hosts will secure you until the slope is open, and they’ll send you on your way. Want to go faster? Ask for a spin push. At the bottom, gather your tube and walk to the lift that brings you back up to the top. TIP: Get more runs in by walking to the farthest lift; the employees say all hills are same speed. Everyone rides their own tubes. For those traveling with smaller children, you are allowed to go down at the same time, both tubes, with the adult securing the rope to the child’s tube. For children who are under the minimum height requirements or would like a smaller tubing hill, the Keystone Nordic Center offers an old-fashioned Family Tubing Hill. Make it a multigenerational race. Stagger your family members on different lanes and tell the Keystone employees that your family would like to race to the bottom. You may have to wait a minute or two to time your positions, but well worth the delay. Don’t worry. All tubing hills end at the bottom. You can each ride individually and wait for each other at the bottom. Cost: $32/person for 1 hour, tubing sessions run only 1 hour long. Restrictions: Must be 42 inches or taller to tube. Open: Daily through April 12, 2015, check website for hours of operation. Keystone Resort provided my family with Snow tubing passes; opinions expressed are my own.